Dolce or dolcetto is the generic term for dessert or pastry (or pudding, if you're a Brit); dolciumi are sweets, or candy, or confectionery in general. Dolce also means soft or tender, and is used to describe fresh cheeses; the opposite of piccante. Dolce del Santo (or Dolce Santantonio): A speciality of Padua in the Veneto shaped like St Anthony's halo, made with sponge, granella di amaretti, candied orange peel, apricot jam, and marzapane baked in pasta sfoglia. Dolce di San Martino: cut out pieces of pasta frolla in the shape of St Martin on horseback, and colourfully glazed; made in Venice for St Martin's day (11 November). 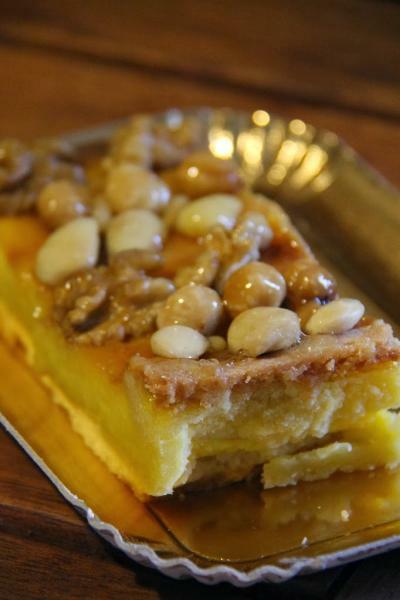 Dolce di San Michele: or dolz as San Michele a rich gooey cake made with panna cotta, almonds, walnuts, hazelnuts and pine nuts and a glass of passito made since the year 1000 in Bagnacavallo in Romagna in honour of the town's patron St Michael (29 September).